There are wildflower quilts and then there are simple, charming handmade quilts like this native wildflowers quilt at Mastodon State Park in Imperial, Missouri. I will try not to digress into my Mastodon hunting lesson. Mastodon State Historic Site is a publicly owned, 431-acre archaeological and paleontological site with recreational features in Imperial, Missouri, maintained by the Missouri Department of Natural Resources, preserving the Kimmswick Bone Bed. Did you know Missouri had mastodons, a relative to elephants, about 12 million years ago? Me, neither, so the stop at this site was delightful in many ways. There were bones of the giant beavers that roamed Missouri as well as an award-winning mile high pie nearby but I would just as easily tucked this native wildflowers quilt in my bag to bring home where it even possible. The staff on duty didn’t know the name of the quilter but we can all read the name of the hand applique flowers. Delightful handmade native flowers quilt at Mastodon State Park, Imperial, Missouri. 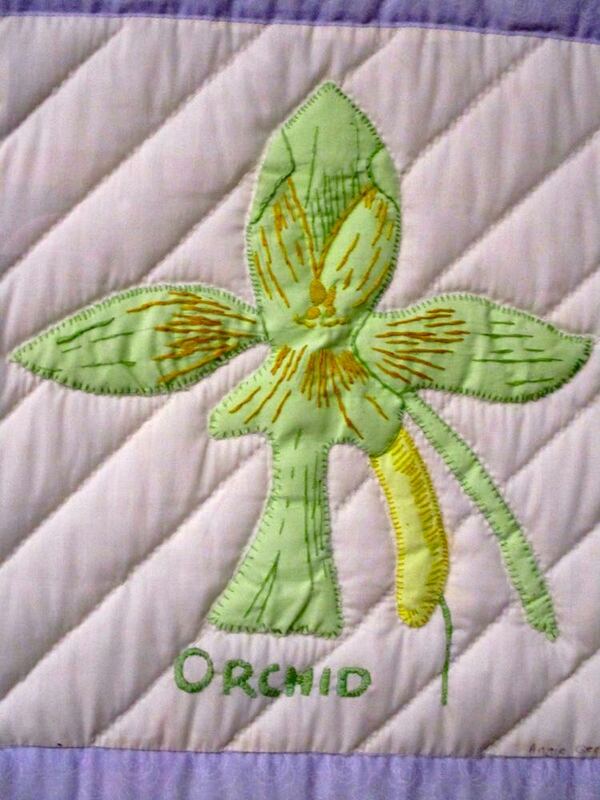 Missouri’s wild columbine is one of my favorite native spring flowers so I was tickled to find it applique on this handmade quilt. Notice how the red embroidery floss on red cotton gives the flower an extra dimension. Same thing with this Jack in the Pulpit flower quilt square only the embroidery floss is easier to see on this flower applique pattern. Another lady visiting at the same time I was at the park said she thought the flower names were free hand embroidered and I can see why she said that, each seems to have a simplicity to the lettering. Not all of these flowers can easily be found in Missouri’s native woods and prairies. I can’t remember the last time I saw a yellow lady slipper, a form of orchid, in one of my walks. Talking to one of the George O. White Nursery staff in Licking, Mo. last year, she said Pawpaw tree seedlings are one of the first of their seedlings to sell out now, although only a decade ago no one seemed to want to plant them. The paw paw tree can get rather large so I doubt I can add one to my hillside garden but I may opt for a bonsai one one of these days. Another native flower that gives me much joy to find is yellow tickseed and wild violets, both native flowers that are challenging to cut to bring inside so I leave them. Just a couple more quilt blocks to share. The top one reminds me of the wild sweet pea vines I have tried to transplant from a friend’s house to no avail, I may have to settle for one in fabric. The second block is out of focus but morning glories are easy to grown and can quickly become a nuisance for garden planners who want a well-organized garden. I am not one of those so this year I may be adding blue morning glories to some of my trellises. So there you have it, a short tour of some of Missouri’s native trees and flowers, all excellent plants for pollinators. Oh, wait, I was talking about a handmade quilt about Missouri natives, wasn’t I. Aren’t you lucky that I didn’t veer off into Mastodon hunting!